Massive 2000mAh capacity with Sub Ohm capability battery in stock in Australia. The Aspire CF Sub Ohm battery is a great addition if you own an Aspire Atlantis Tank. The device is equipped with a built-in 2000mAh capacity rechargeable battery, capable of producing a max out current of 40A. The mod is great for sub ohm atomizers that can take as low as 0.3ohm. The tube is made with stainless steel and a beautiful carbon fiber housing. The unique spring connector technology ensures to always provide a strong connection between the battery and atomizer attachment. The stainless steel metal button makes it easy to press and lights around the button for different purposes. Order Aspire CF Sub Ohm Battery MOD for best deal and genuine from Electronic Cigarette Australia. Introducing the Aspire CF Sub Ohm Battery MOD. Once they have done...Aspire delivers again, with an eGo Style SUB OHM capable battery boasting a whopping 2000mAh capacity. 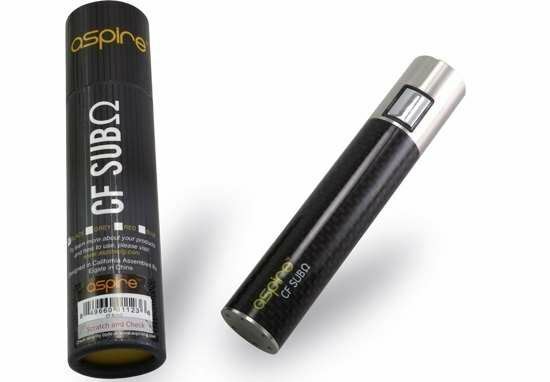 The Aspire CF Sub Ohm battery is capable of powering resistances as low as 0.3 Ohms!. The Aspire CF Sub Ohm battery has all the great features of the Aspire Carbon Fibre battery like spring loaded conncector , carbon fiber tough body, with stainless steel end points. It gives max output current of 40A. Definitely the most powerful eGo form factor battery on the market. Pair this with the Aspire Atlantis Sub Ohm Atlantis Clearomizer and you have one hell of a kit which will produce lots of cloud !! Note: Requires eGO style USB charger NOT included. Over discharge Protection: When battery cell voltage is less than 3.2v(low battery), the atomizer will remain OFF and the orange LED will blink 15 times. Charging Short Circuit Protection: If the charger is short circuited while charging the battery will default to OFF mode , stop charging and battery light (both colors) will flash 6 times. Warning: Always keep battery dry and away from moisture. Do not dismantle or expose the battery compartment-this will result in malfunction. If the indicator light displays ON continuously or product becomes hot- immediately disconnect the battery from the tank to break the electric conection.